The Volkswagen Polo is well established and regarded as a reliable, competent small hatch. Having been recently face-lifted, the Polo boasts an engine overhaul, with the 1.4-litre petrol engine being replaced with a new, cleaner three cylinder 1.0-litre. The small hatch now touts 108bhp. The torque figures are impressively high for such a small capacity engine at 147lb ft  thanks to its turbo. Meanwhile, fuel economy reaches 65.7mpg, which is an impressive achievement. This power-plant is mated to a manual gearbox, which, thankfully, includes a sixth gear, leaving the engine wholly competent on the motorway. Integrating Volkswagen's BlueMotion technology, the Polo has stop start technology, alongside battery regeneration which recuperates energy during braking to keep the battery levels topped up. The R-Line specification we are focusing on boasts 'race' specification seats with microfiber side bolsters, along with a leather trimmed gear knob, handbrake grip and multifunction steering wheel. The 'R-Line' styling kit includes handsome front and rear bumpers, LED headlights and rear tinted glass. 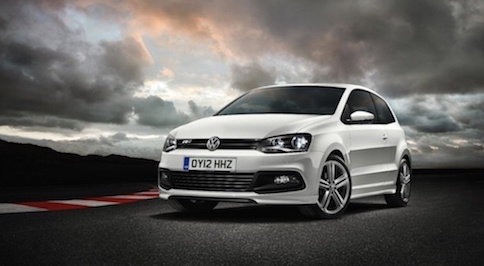 All of these tweaks ensure the Polo is no shrinking violet, with a quietly aggressive stance. To drive, the Polo is the very definition of a diminutive, fun and economical hatch, providing enough power to get your pulse racing, despite returning strong economy figures. The small Volkswagen�is assured and stable on motorway journeys, whilst providing accurate steering when the road gets twisty. If you're searching for a small, efficient hatchback  which matches solid build quality with polished handling, you won't find a better car than the latest Volkswagen Polo.